The star of Taken and The A-Team jumps back into action with brute force! Liam Neeson plays Dr. Martin Harris, who awakens after a car accident in Berlin to discover that his wife (January Jones) suddenly doesn’t recognize him and another man (Aidan Quinn) has assumed his identity. Ignored by disbelieving authorities and hunted by mysterious assassins, he finds himself alone, tired and on the run. Aided by an unlikely ally (Diane Kruger), Harris plunges into a deadly mystery forcing him to question his sanity, his identity and just how far he’s willing to go to uncover the truth. $25.620 million on 3043 screens. 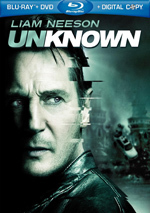 After the success of 2008’s Taken, Liam Neeson finds himself back in familiar action-oriented territory with 2011’s Unknown. Dr. Martin Harris (Neeson) and his wife Liz (January Jones) visit Berlin for a biotechnology summit. Upon arrival at their hotel, Martin realizes he left a bag back at the airport, so he catches a cab to retrieve it. This doesn’t go well. The cab gets in an accident and Martin winds up in the hospital. Apparently no one comes to find him, so when he leaves and stumbles back to the hotel, he looks for Liz. And finds her, but she claims that she doesn’t know who Martin is. Actually, she does indicate that she’s married to Martin Harris – but he’s a different guy (Aidan Quinn). From there Martin One tries to reclaim his identity and figure whether he’s just nuts or if something more sinister is at work. Sounds awfully Hitchcockian, doesn’t it? Unknown clearly nods toward the master, but it doesn’t approach his level of skill. Much of the problem comes from the many stretches of logic that go into the plot. Martin believes that others have arranged for his accident and intentionally stepped into his life. For this to happen, the perpetrators would seem to need to be nearly god-like, as they have to cover so many bases. I say “seem to need to be” because the movie’s ending does offer a decent explanation for all the apparently impossible machinations. Unfortunately, by the time we get to that explanation, it’s too late. In an attempt to be mysterious, the movie asks us to stretch credulity far too often and it doesn’t include any real nods toward the ultimate rationale. Again, I understand that it wants to keep us guessing, but a better constructed film would at least provide a few hints to lead us toward the ending; that doesn’t occur, so the explanation comes out of nowhere and feels like a cheat. Even when you account for the twist at the end, much of the movie doesn’t make much sense. The convoluted plot works so hard to keep us off-balance that it ignores the holes and flaws. I get the feeling the screenwriters started with the clever-clever ending and worked backward from there. The entire film pushes toward the inevitable big twist, so the preceding 100 minutes or so feel cobbled together; the long set-up just doesn’t make a ton of sense and lacks logic. Though the movie comes with a generally good cast, none of them do much with their roles. Jones is as flat and wooden as ever, and Neeson seems like he’s on cruise control. He gives Martin a general sense of confusion and little else as he meanders through the film. A couple of supporting actors add a little spice – I like Frank Langella’s turn as a slippery character, and Bruno Ganz satisfies as an aging former East German agent – but most of the acting remains mediocre at best. In truth, Unknown never becomes a bad movie. It offers a professional production and enough action to keep us moderately entertained. Unfortunately, it simply becomes a victim of its muddled plot; it never quite bores us, but it fails to keep us terribly interested. Unknown appears in an aspect ratio of approximately 2.40:1 on this Blu-Ray Disc. The movie boasted a consistently positive presentation. Sharpness looked good. Virtually no unintentional softness occurred, so the movie seemed concise and well-defined. No issues with jagged edges or moiré effects appeared, and edge enhancement didn’t affect the movie. Print flaws also failed to mar the image. In terms of colors, Unknown opted for a cool palette. It usually went with an aqua tint; other than a few warmer elements – mostly in flashbacks - its tones stayed fairly chilly and desaturated throughout the film. This meant the hues were subdued but fine given the stylistic choices. Blacks were dark and tight, while low-light shots demonstrated nice clarity. Overall, the transfer looked terrific. The movie’s DTS-HD MA 5.1 soundtrack also worked well. The soundscape added a good sense of environment, and when the action scenes materialized, those elements fleshed out the settings well. Various components seemed well-placed and they meshed together smoothly. The different effects used the sides and rears to good advantage, and the score filled out the track in a satisfying manner as well. Of course, audio quality always satisfied. Music was warm and lush, while speech seemed crisp and distinctive. Effects boasted good clarity and range, along with solid bass response. Nothing here dazzled, but the mix satisfied. Only a couple of extras show up here. Liam Neeson: Known Action Hero runs four minutes, 33 seconds and provides notes from director Jaume Collet-Serra, producer Joel Silver, production designer Richard Bridgland, actor/stunt coordinator Olivier Schneider, and actors Liam Neeson, Frank Langella, January Jones, Aidan Quinn and Diane Kruger. We learn a little about Neeson’s casting, character and performance. A few decent details emerge, but mostly the show tells us how awesome Neeson is. Unknown: What Is Known? goes for four minutes, 24 seconds and features Neeson, Kruger, Silver, Langella, Collet-Serra, Jones, and Quinn, and actors Sebastian Koch and Bruno Ganz. “Known” gives us a quick overview of story, characters, cast and locations. It’s essentially a long trailer, as it tells us virtually nothing about the production. The disc opens with an ad for Green Lantern. No trailer for Unknown pops up here. A second platter provides both a digital copy of Unknown for use on computers or digital portable gadgets as well as a DVD copy of the film. This delivers a barebones package, so don’t expect any extras. With an intriguing plot, Unknown could’ve offered a fun update on Hitchcock. However, the storyline becomes confused and illogical, and that tends to drag down the entire enterprise. The Blu-ray gives us excellent visuals and solid audio but it lacks substantial supplements. Though I like the presentation, I can’t recommend this plodding attempt at a thriller.